In celebrating 20 years since the publication of this book, what should we especially celebrate? Rinpoche: I think Rinpoche’s book on Living and Dying is one of the first teachings on Vajrayana Buddhism from the Tibetan tradition that became accessible for people in the mainstream, those who were interested in the teachings on wisdom and compassion. So I think the publication of this book was something historic and we must celebrate it as a moment in time when Buddhism really began to take root in the western in countries. What specific role do you think The Tibetan Book of Living and Dying has played in the modern world? Rinpoche: It has benefited a lot of people—many sentient beings— especially in the western hemisphere. Rinpoche’s teachings have contributed a great deal to addressing one the most difficult situations of our existence: death and dying. I think these teachings have made such fears of death and dying a little bit more manageable. Not just Tibetan Buddhist practitioners, people of all kinds of faith have benefited from these teachings. Why do you think this book was so popular? Rinpoche: I think there are a few reasons. First of all, it’s very accessible. Secondly, it contains so much of the great wisdom teachings from the Tibetan masters like His Holiness Dudjom Rinpoche, His Holiness Dilgo Khyentse Rinpoche and so on, not to mention Rinpoche’s own teachings. It is a collection of all the wisdom teachings, brought together in such an accessible way. A third reason is that the appeal and relevance of its teachings go beyond just a Buddhist audience. In being so inclusive, it offers so many possibilities for Christians, Jews or people of any kind of faith. Perhaps a fourth reason is that it speaks about something that people are really interested in: death. It is very intriguing why this subject is so interesting for people. It’s like our biggest fear. On one hand we have so much interest in it, and on the other hand we don’t want to go there. We have a love-hate relationship with death and dying. Has Sogyal Rinpoche’s book had an influence on you as an author and teacher of Buddhism in the modern world? Rinpoche: Generally speaking I think Sogyal Rinpoche’s activities in the West have been wonderful, ground-breaking and foundational. They have helped to make a lot of Dharma activities possible. So I think Rinpoche’s dedication and sacrifice in his work here in the west over the last decades have been a genuine support for any Tibetan Buddhist Activity. 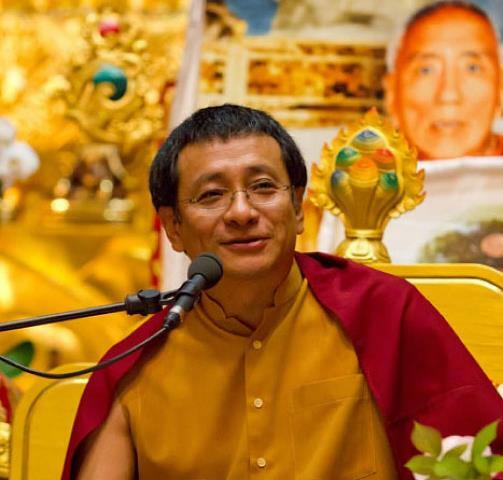 Dzogchen Ponlop Rinpoche is a leading Buddhist teacher in North America and an advocate of American and Western Buddhism. A lover of music, art and urban culture, Rinpoche is a poet, an avid photographer, an accomplished calligrapher and visual artist. He is the founder and president of Nalandabodhi, an international network of Buddhist study and meditation centers, and of Nitartha International, a non-profit educational corporation dedicated to preserving the contemplative literature of East Asia.